Florida has a knack for turning family dysfunction into national spectacle. Ten years ago it gave us the Elian Gonzalez mess; five years later came the Terri Schiavo debacle. Now we have a new domestic dispute that threatens to become another culture-war circus, complete with a clash-of-religions angle to boot: the battle for Rifqa Bary, a 17-year-old girl from Columbus, Ohio, who ran away to an Evangelical church in Orlando, Fla., because, she claims, her Sri Lankan Muslim family has threatened to kill her for recently converting to Christianity. 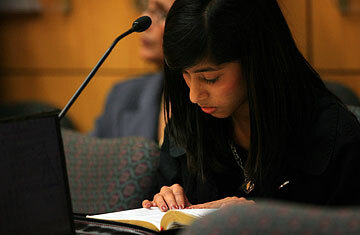 The saga began in mid-July when Rifqa, after a dispute with her parents, bolted from her home and rode a bus to Orlando. There she took refuge with the Rev. Blake Lorenz, the pastor of a conservative Christian congregation, the Global Revolution Church, and his wife Beverly, whom the cheerleader and honor student had met on Facebook. Almost three weeks later, on Aug. 6, the Lorenzes finally let authorities and Rifqa's frantic parents know the girl was with them. Then, a few days later, Rifqa dropped a bombshell to an Orlando television station: she had run away, she claimed, because her family, angry about her conversion to Christianity, had "threatened to kill me." Wearing a white dress and a silver cross, her dark hair often falling over her scared eyes, the small and slender Rifqa insisted in the TV interview (now on YouTube) that her father Mohamed Bary, a Columbus jeweler, "said he would kill me or send me back to Sri Lanka," where she said "they have asylums where they put people like me." She said her death would be a Muslim "honor killing," the kind of murder that women in deeply conservative Muslim societies are sometimes victims of when they're deemed to have shamed their families. (The U.N. Population Fund estimates that there are as many as 5,000 worldwide honor killings every year.) Rifqa said that her father, upon discovering her Facebook profile and its declarations of her Christian faith, told her, "If you have this Jesus in your heart, you're dead to me, you're not my daughter." She added, almost hysterically, "They have to kill me ... I want to worship Jesus freely. I don't want to die!" It's a serious charge that any law-enforcement or social-services official would have to look into, particularly since there have in fact been some extremely rare instances of honor killings in the U.S. Most recently two Dallas-area sisters were murdered last year, allegedly by their Egyptian-born Muslim father, who relatives say was enraged that his daughters, 18 and 17 years old, were dating non-Muslim boys. (The father is still at large and is believed to have fled the country.) But Mohamed Bary and his wife Aysha adamantly insist it is "completely false" that they ever threatened to kill Rifqa over her conversion. "We love her; we want her back. She is free to practice her religion, whatever she believes in. That's O.K.," Mohamed told the Associated Press last week. Columbus police tell TIME they're watching the case closely and are in contact with the courts and social-services agencies in Ohio and Florida; so far they have found no evidence or other information to support Rifqa's accusation. Craig McCarthy, one of two Orlando attorneys appointed to represent the Barys in Florida, says that while they may have been dismayed at first by Rifqa's conversion, as devout parents of any faith would be, they are hardly the kind of fundamentalist Muslims who would declare a medieval fatwa, or death sentence, on their daughter. "There is a vast, vast difference between not being pleased that your child has not chosen your faith and wanting to kill your child," says McCarthy. "This is a family with Westernized kids. Their daughter is a cheerleader."